Rhys Hoskins hit the first two home runs of his career Monday night. 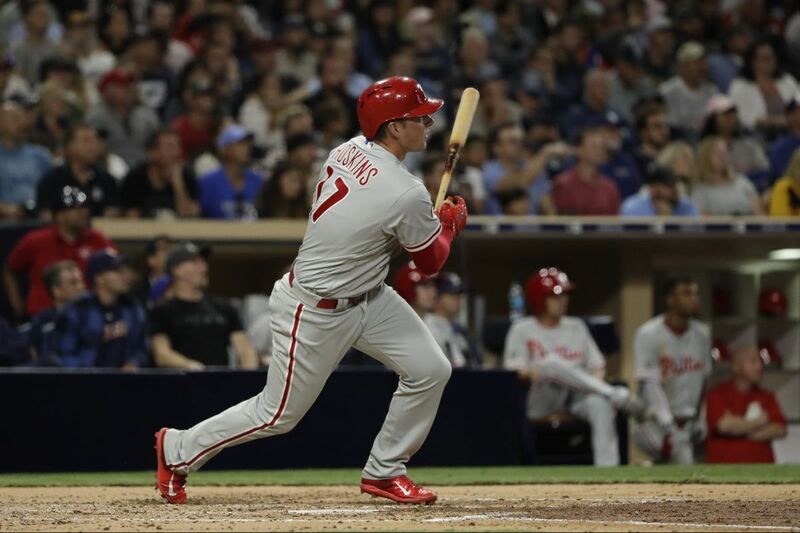 SAN DIEGO — Twice, Rhys Hoskins stepped on home plate Monday night and pounded the "P" on his red helmet with his left fist. He had done it. His first two home runs, a combined 811 feet of crushed baseballs, in his native state with a sizeable group of friends and family in the Petco Park seats. The season is reduced to silver linings and dreams of future bliss, so that is what they will glean from a 7-4 loss to the Padres. Jerad Eickhoff lasted just five innings. Ricardo Pinto relieved him, and it was ugly. The Phillies' defense was porous and careless. But there was Hoskins, 24, doing what the Phillies expect him to do for years to come. He had one hit — a single — in his first four major-league games. He clubbed two fastballs in the fourth and seventh innings Monday. Hoskins was the first Phillies hitter to smash his first two career homers in the same game since Scott Rolen in 1996. The rookie was raised 500 miles north of here, in Sacramento, and his cheering section Monday reached 30 or 40 people. With the aid of ballpark security and postgame autograph exchanges, Hoskins retrieved both of his home-run balls. "It's something I'll have for the rest of my life," Hoskins said. He lined out to first base in his first at-bat. When Hoskins returned to the dugout, Phillies hitting coach Matt Stairs reminded him about a message from their pregame chat. Time your swing better, Stairs had told Hoskins. Swing earlier, catch the fastball at a better spot. "The second at-bat, I did it," Hoskins said. It was a full-count fastball from Travis Wood. Hoskins knew that. But he could not describe the feeling of his first major-league home run. "I don't really remember it, to be completely honest," he said. Not even the trip around the bases? "No," Hoskins said. "Not one bit. Not one bit. I think it hit me as soon as I got in the dugout." That's where the Phillies had some fun. Hoskins noticed that Tommy Joseph, the next hitter, did not congratulate him on his homer. "He kind of stone-colded me," Hoskins said. The Phillies honored Hoskins in the dugout with an impressive silent treatment. "I immediately knew it was coming," Hoskins said. "I started laughing." Inside the dugout, greeted by no one, he started to high-five the air. He jumped, as if to smush against an imaginary teammate. He ambled through the entire dugout, end to end twice, without an embrace. He found bench coach Larry Bowa at the bat rack, and they bashed forearms. Odubel Herrera emerged from a nearby staircase and, apparently oblivious to the silent celebration, followed Bowa's lead and acknowledged Hoskins. The rest of the Phillies players waited 25 seconds before mobbing Hoskins in the corner of the dugout. "He looked a lot better at the plate," Phillies manager Pete Mackanin said. It was a lighthearted moment for the team with the worst record in baseball. The rest of it was forgettable. Eickhoff permitted the first batter to reach base in four of his five innings. He could not command the ball. He allowed just two runs (one earned), but his high pitch count forced the Phillies to dip into their bullpen by the sixth inning. "It's just how it's been this year," Eickhoff said. "It's not going to come easy and I'm not going to shy away from it and be timid about it. I'm going to meet it head on and keep working." The Phillies will shift Mark Leiter Jr. into the rotation Tuesday, and he may not be able to provide much more than 80 pitches. They were without long man Adam Morgan, who threw 43 pitches Sunday. So Pinto had to soak some innings Monday. "Then again, we want to see these guys pitch," Mackanin said. "They're all young and they're learning. They make mistakes and hopefully learn from them." San Diego batted around in the sixth inning. Pinto walked two batters, and both scored. A broken-bat grounder to shortstop produced no outs. Herrera, who extended his hitting streak to 17 games earlier in the night, threw to the wrong base on a sacrifice fly. That allowed a second run to score on a subsequent single. It was the sort of inning that will drive a sane baseball person to question everything. Those innings are common for the Phillies. So, they went to bed thinking about Hoskins and his powerful swings.